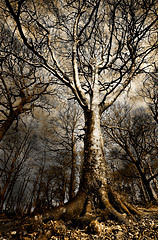 I first experimented with this toning technique on a shot of a beech tree from Castlehead Wood, near Keswick and have since used it on a number of shots. It’s a simple procedure that I’ve been asked about a lot over the last couple of years so I thought it’d be a good technique to kick off my new tutorials section. In this tutorial, we’re going to give an image the same toning treatment as Castlehead Wood so you can see step by step how to create it. In a nutshell, we’ll tone the saturated parts of the image but leave the unsaturated parts grey. On the right shot though this can blend some of the strengths of both colour and black and white into one shot, creating a best of both worlds by removing full colour but leaving the contrast that comes from variation in saturation. I’ll show the technique in Photoshop CS2 initially but I’ll cover Gimp equivalents at the end too. 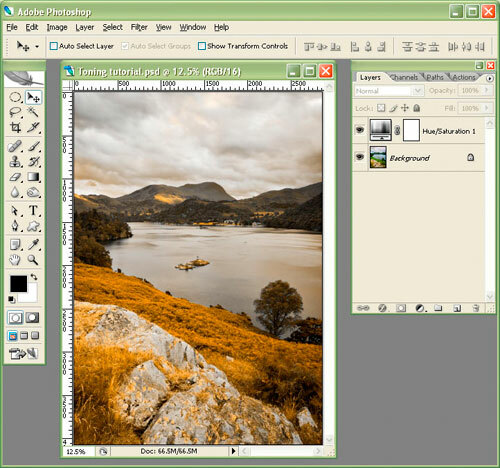 Here’s the image we’re going to tone (it’s of Ullswater, taken from Silver Point). The important thing to note at this point is the difference in saturation across the image. There are some vivid green and yellows in the grass, more subtle blues in the sky and lake, and almost pure grey rocks and clouds. The actual colour (hue) of these elements isn’t important but their saturation is what counts. OK, so creating the toning effect is to pick a hue for the image. To do this in Photoshop, first add a new Hue/Saturation adjustment layer. Now pick a hue for your image. I’ve chosen a value around 40 for a sepia tone. You’ll see that you now have a fairly standard toned image, with the toning applied over the whole shot. To make the toning affect only the saturated parts of the image, we change the blending of the layer. 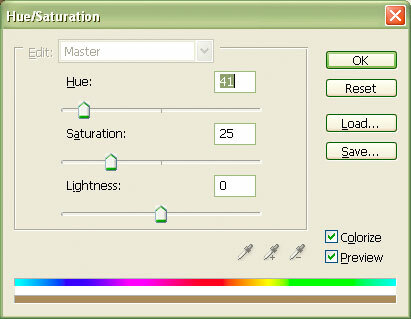 Drop down the blending modes box and select ‘Hue’. What this is doing is using the layer to change the Hue only, leaving Saturation and Lightness unaffected. You’ll see that now the saturated parts of the original image, such as the grass, have picked up a strong tone whereas the unsaturated parts of the original are left grey. The effect is a little too strong on this image for my taste, so we’ll sort that out in the next step. 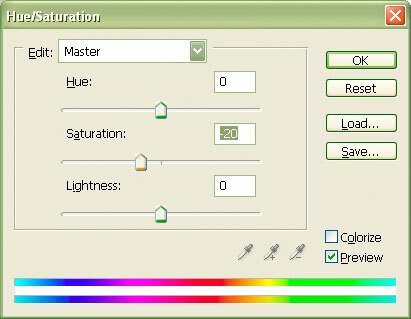 It usually helps to fine tune the overall saturation after toning has been applied. In this case I’m going to add another Hue/Saturation layer and use it to reduce the overall saturation. Add a second Hue/Saturation adjustment layer using Layer->New Adjustment Layer->Hue/Saturation as before, then drag the saturation around until you’re happy. Here’s the end result. If you compare it to the original you can start to get a feel for how the toning gets applied to the more saturated parts of the image and look for shots where it can be used. It’s fairly simple to create a similar toning effect in Gimp. The major difference is that there aren’t any adjustment layers to work with but we can deal with that easily by duplicating a layer instead. For this part of the tutorial I’m working with Gimp 2.4.5 and Ubuntu Linux. 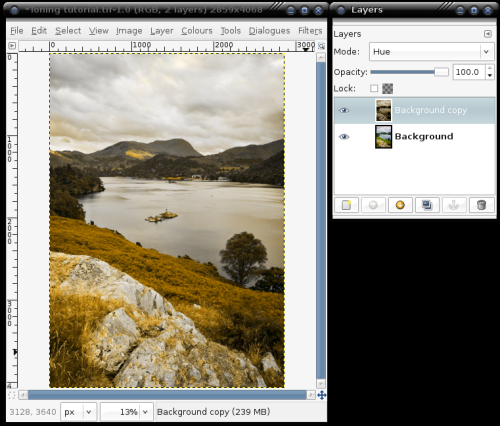 With the image open in Gimp, make sure the layers dialogue is displayed as below (if not, hit CTRL-L or use Dialogues->Layers from the menu). Then duplicate the layer to be toned by right clicking on the layer and selecting ‘Duplicate Layer’. 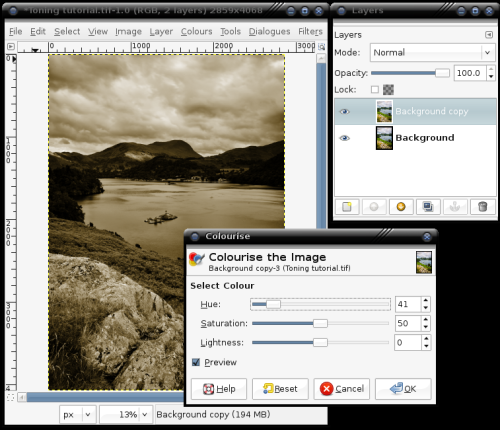 Now tone the new layer by selecting Colours->Colourise from the menu and choose a hue. I’ve gone for 41 again, as I did in Photoshop. 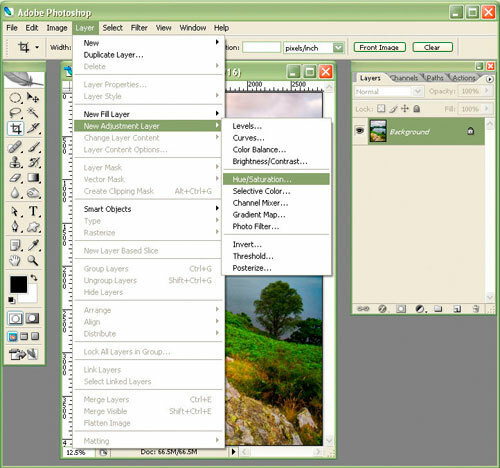 Finally, in the layers window, drop down the ‘Mode’ box and select ‘Hue’. And that’s it. By applying the toning to a duplicate of the layer and setting the mode we’ve limited the changes to Hue only. The saturation and lightness from the original show through.